2012 is nearly over. It’s time for doing celebration and you might have started preparation of New Year 2013 party or Christmas. Apart from this some important financial deadlines are looming. 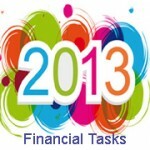 Make time for 8 year end financial tasks mention below and you could have richer 2013.